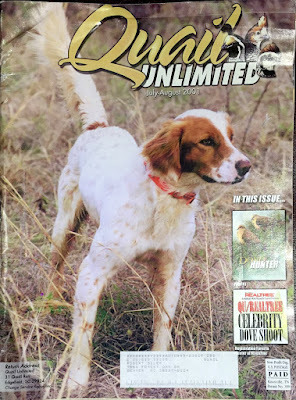 This is a reprint of an article I did chronicling my adventures with Bocephus. The subject of wolves has come up, again, mainly due to the tremendous success of the re-introduction and growth in wolf population. Many bear dog encounters are ending badly. Last year, I was introducing some friends to the Northwoods. I would point to a trail head for them to hunt in the morning, tell them where I was going to be, wish them luck and agree to meet for lunch, or, failing that, dinner back at the motel. As luck would have it, the warm fall day started turning dark a little early, and it was almost black by noon. The rain started as a sprinkle and then gradually got worse. We put out on a trail that produced a lot of birds over the years. I was the only one on it and I determined that a little rain wasn't going to interfere with a grouse hunt. I did swap my guns out, though, and the little Fox went back into the case, replaced by a 20-ga. SKB Model 100, I used for weather like this. Bo and I started down the trail with him running ahead to veer off to one side. And that was that. He was gone. I walked and whistled and listened for his beeper for about an hour. The rain was heavy at times but merely a downpour at others. He could have been 20 yards out in the thick growth, on point, and I would not have heard or seen him. Finally, I returned to the truck, dried off, cleaned, dried and oiled and cased the gun, put on some dry clothes and headed out to find my dog. The trail was about 3 miles long-6 miles out and back. It was getting darker now and I was getting a little more concerned about the old boy. The good thing was the temperature was quite warm-in the 60's. If he did have to spend the night in the woods, I was sure he would be able find a dry spot and stay warm. 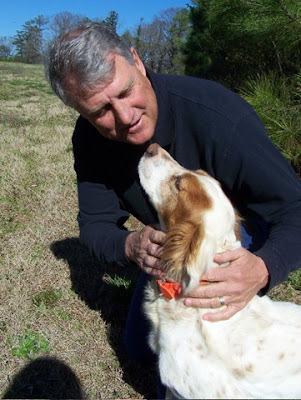 The Knothead was a wonderful bird dog! Walking, whistling, listening and bouncing between anger and concern as I walked down the trail, I rounded a bend as the trail dropped off sharply. I stood for a minute listening and staring down the trail. Suddenly, a big, gray shape stepped out on the trail about 50 yards away. He was looking down the trail, away from me. After a second or two, I recognized him as a Gray Wolf. Instantly, I realized he and I were looking for the same thing. I was looking for my old bird hunting companion. This big, gray boy was looking for dinner, and it downright pissed me off! "Hey" I yelled, "Get out of here!" (Or words to that effect and edited for content.) I expected him to jump and run like the coyotes I'd encountered numerous times out West. His reaction was quite a bit different than I anticipated. That huge, majestic canine slowly turned his head to the right and looked me right in the eye. Then, he slowly turned back to the left and trotted down the center of the trail without so much as backward glance. Even now, I'm impressed with him. He was huge-easily three times the size of my bird dogs, which would make him over 100 pounds! And as he trotted off, in the direction of my lost dog, he more glided than ran. Just then, I came to the realization that I was completely unarmed! It was one of the few times in my life I really did want a gun in my hands-and it was resting, dry and well oiled, in my truck over a mile away. Not thinking all that clearly and remembering the literature I'd read about wolves not bothering humans (yeah, except for the thousands of years of history and stories about wolves devouring little kids and old men ... the big, bad, wolf, and on and on ....) I pressed on down the trail calling and keeping a careful eye behind me. An hour or more later, at the end of the trail, I turned and headed back to the truck. Concern now was for my ability to make it back before dark. I picked up the pace. Head down in the rain and moving along pretty quick, I rounded a bend and there he was. 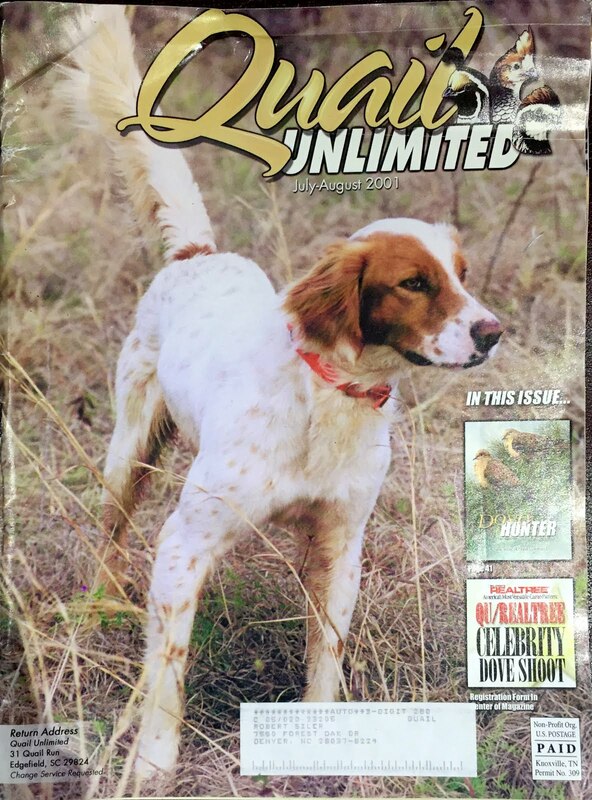 A 35 pound bundle of shaking, wet Setter! I'm not sure who was happier to see the other, but I got down on my knees and hugged that mutt and thanked Jesus for the one more time he answered my prayers. We didn't stay long on that trail in the rain, and I put him on a lead and headed out. He was so tired he tried to lay down a few times and, finally, I had to pick him up and throw him over my shoulders. We needed to get out of those woods-now! The sun was long gone behind thick clouds and darkness was settling in. The GPS said we had more than a mile of up and down to go. I remembered that song from the '60's-"He ain't heavy, he's my brother...." as I carried him up and down hills, slipping on the up slope with rain dripping down my neck and wet dog scent in my nose. Song or not, don’t believe it, he got heavy as this old man got close to the road. I put him down and we finished side by side-both of us limping and panting hard. Back at the motel, I checked the old campaigner over for cuts, bruises and ticks. It was then I noticed blood on my hands when I ran them over his haunches. I turned him around and gave him a closer inspection. On his right rear leg, just below the tail, was the perfectly round hole of a canine tooth! Bo wasn’t talking, but to this day I think he encountered my big, gray friend, too. I think we were being watched during our little reunion on the trail, in the rain, in the Wisconsin grouse woods.